﻿ Western Japan Trading Co., Ltd.
Western Japan Trading Co., Ltd. The Kinki Osaka Bank, Ltd. The Japan‐China Treaty of Peace and Friendship concluded. Start up business with common steel, industrial machines, and plant installation. Export air compressor for Shanghai Hitachi's AC. Established Western Japan Trading (Shanghai) Co., Ltd.
Make exporting contract of compressor for AC with Qingan AC Equipment Ltd.
Make the exporting contract of color brown tube plant to Xianyang. Established Keiwa Trading (Shanghai) Co., Ltd.
production　with　Sidike New Materials(Jiangsu) Co.,Ltd. 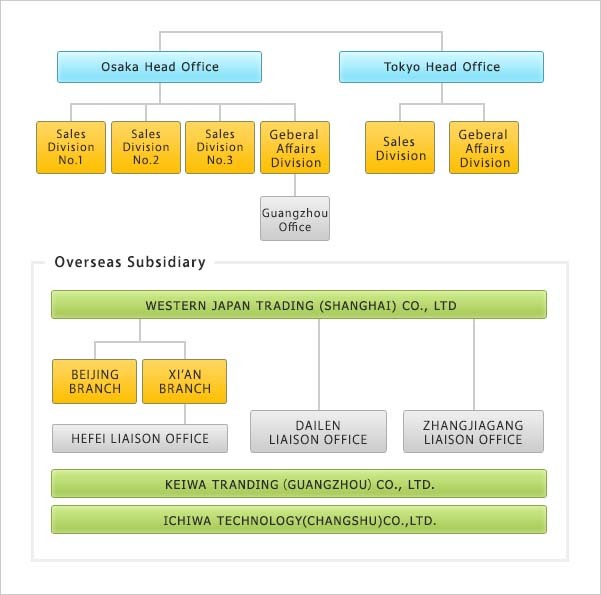 Integrated Shanghai Office into Western Japan Trading (Shanghai) Co., LTD.